A collection of unreleased & compilation-only tracks. Truth & Beauty is a perfect blend of Steve’s rich atmospheric and tribal ambient infused work. Originally released in March 1999 on Steve’s own Timeroom label, this album is now co-released by Timeroom and Projekt, at a nice-price. This will be the first time the album is available in retail stores. Though the 10 tracks were recorded over an 11-year period in different environments and for different creative projects, they work remarkably well together as a whole. Five of the tracks are previously unreleased covering sessions from Dreamtime Return, the Suspended Memories collaboration with Suso Saiz on guitar, Stormwarning and Artifacts. Complimenting those pieces are 5 tracks recorded specifically for now out-of-print international compilations. They work together to create a connected storyline, like the soundtrack for an imaginary film. 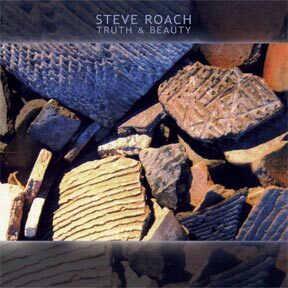 Truth & Beauty is an exploration into the enduring power of Steve Roach’s artistic vision.